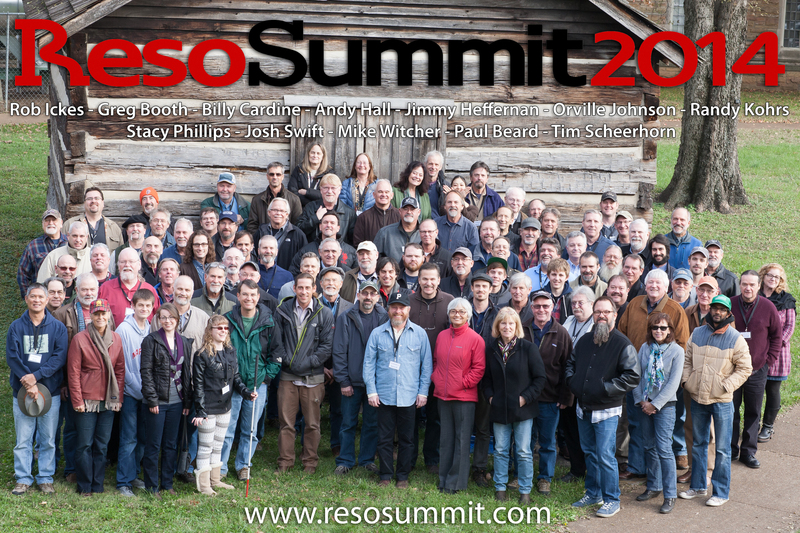 Thanks to everyone who made the 8th annual ResoSummit so special! Click on the above photo for a high-resolution version of the photo you can download. The photo is a 3.64MB file and has a 2x3 aspect ratio. 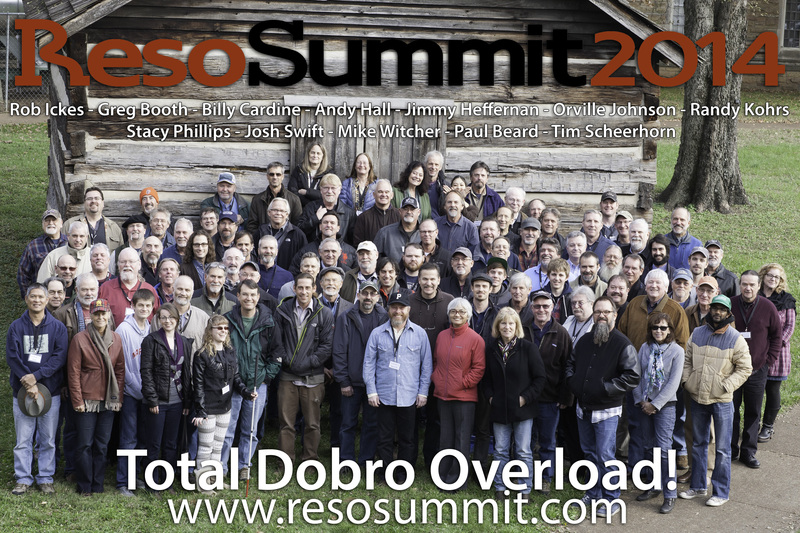 Click here for a high-resolution version of the above photo without the "Total Dobro Overload" caption (7.60MB file). For a version formatted for 8x10 printing, click here (2.95MB file). Also watch this space for a gallery of 2014 photos. Use the link above to get the 18-page PDF that contains detailed workshop descriptions. Use the link above to get the workshop schedule as it appears on the survey. We recommend either printing your survey before you submit it, or marking your responses on a printout of this PDF. Includes all workshops & activities, 3 Station Inn performances, the new "small group" workshop, and the closing Dobro All-Stars performance. Does not include optional on-site housing or meals.Optional on-site meals are available by pre-order, with orders taken closer to the event. The registration fee is $20 higher than 2013, reflecting our increased costs. The prices for on-site housing and meals are unchanged from 2013. A $125 registration fee deposit is due upon registration, plus a $100 deposit for any on-site housing you wish to reserve. The balance is due on or before August 1, 2014. Every year, we are able to make offers to people on our wait-list. Signing up is easy: click the link below, and complete a simple sign-up survey. The date and time that you submit the sign-up survey establishes your priority on the wait list. Note that in our discretion, we may give higher priority to international wait-listers, given the logistical complexities involved in attending ResoSummit from abroad. ON OR BEFORE AUG. 1, 2014, registration fees and on-site lodging deposits are fully refundable minus a $25 cancellation fee. FROM AUG. 2 THROUGH OCT. 1, registration fees are 50% refundable. On-site lodging & meals payments are refundable if we are able to reassign your room and/or meals to another participant. Otherwise, lodging & meals payments are nonrefundable. ON & AFTER OCT. 1, registration fees and on-site lodging and meals payments are non-refundable. At registration on Thursday afternoon, and during ResoSummit, you can buy "friends and family" tickets (price TBA) so that your family members or friends can join you for the evening performances at The Station Inn. You can also purchase on-site meals for your friends and family (by pre-order, in advance of the event). Family and friends are welcome to participate in after-hours jams on instruments other than dobro (and we especially encourage bass players!). However, workshops and other daytime ResoSummit activities, including the opening session, are open to registered participants only. You may bring family/friends to the closing performance on a space-available basis. Ever the busy bee, resonator guitarist Rob Ickes has for several years now been taking time out of his hectic schedule to preside over ResoSummit, an instructional camp that’s only half-jokingly billed as “total Dobro overload by design.” [By] way of showing off the instrument and some of its best masters, each night finds campers — and the public — gathering up at the Station Inn for related shows. 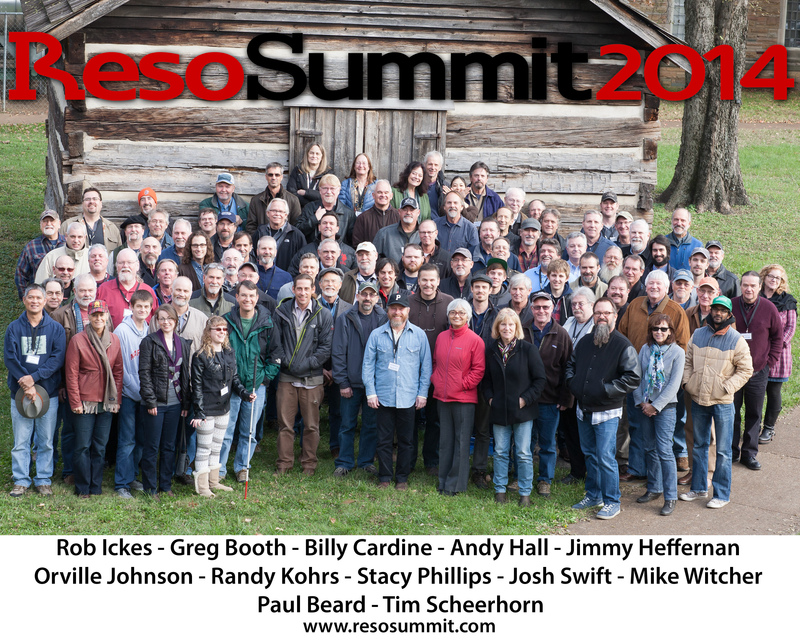 It is always a stunning lineup..."
ResoSummit begins on Thursday, Nov. 13. Registration opens at 3pm, and on-site room check-in opens then also. 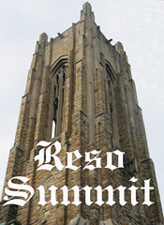 There is an optional "get acquainted" dinner at 5:30pm in the Susie Gray Dining Hall at the Scarritt-Bennett Center, our ResoSummit "home", and the first official event of ResoSummit will be an 8pm performance at the Station Inn. Informal jamming space will be available beginning at 1pm, and is available after-hours each day of ResoSummit, as deep into the night as you wish to use it. Friday, Nov. 14 features an all-Summit opening session, where you'll meet the faculty and hear them play in duos. Three workshop sessions follow, plus an "optional activities" hour with options ranging from informal performances and demos to one-on-one opportunities to consult with faculty and our staff luthiers during "office hours". After a dinner break we'll be back at the Station Inn for a performance, followed by informal after-hours jamming. Saturday, Nov. 15 has a similar schedule, with four workshop sessions, plus an optional activities hour, and an 8pm performance at The Station Inn. Sunday, Nov. 16 features two morning workshop sessions, plus one 2-hour session after lunch. There is an opportunity on Sunday for a workshop at a nearby recording studio, and the 2-hour final workshop is a good opportunity for a more in-depth treatment of key topics. 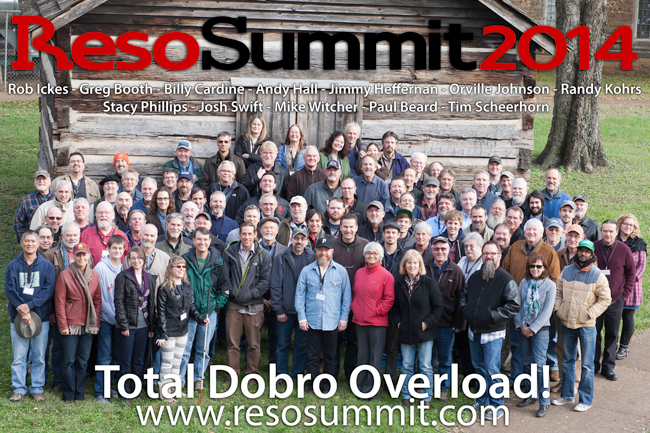 ResoSummit then closes with "Dobro All-Stars" faculty performance, which will end by 6pm. Some participants leave on Sunday afternoon or evening; others stay overnight and leave on Monday, so we provide after-hours jamming space for Sunday night. NEW FOR 2014: We will be offering special workshops that will give interested participants an opportunity to be in a very small (6 max. ), level-controlled, and highly-participatory workshop, focusing on individual critique and feedback. Details will be in the 2014 Workshop Schedule, and participants will be surveyed in advance of the schedule's publication to help us best design these small-group sessions.